Monday afternoon the Seattle City Council approved $1.4m to purchase Pronto Cycleshare’s privately-held assets. The buyout gives Pronto a needed infusion of cash to keep service going while the City prepares to financially restructure the struggling bikeshare service. The City will retain the private operator (Motivate Co) through the remainder of 2016, and will issue an RFP to take over the contract and expand the service in the coming years. The Council majority honestly conceded Pronto’s operational issues multiple times, but ultimately spoke in favor of a seamless transition, ensuring continuity of service, and an ongoing public stake in bikeshare. Indeed, in many of the subsequent amendments (all of which passed unanimously), Councilmembers indirectly made the case for public ownership. Councilmember Gonzalez passed an amendment to spend $50,000 on low-income and multilingual access for bikeshare, and Councilmembers Juarez, Johnson, and others spoke numerous times in favor of expanding low-income access, citywide expansion, and more. Each of these are laudable social justice goals, but none of them are performance-enhancing requirements. By voting unanimously for values that privilege access and equity over performance, Councilmembers effectively showed why such a system is better off in at least partially public hands. That is a trade I am perfectly comfortable with as long as those values are transparent and we evaluate the system’s performance accordingly. O’Brien also passed an amendment requiring that 5 specific stretches of protected bike lanes be constructed prior to any expansion, including completing 2nd Avenue from Denny to S Washington St, completing the Westlake cycletrack, and completing the cycletrack on 9th Avenue North between Westlake and Denny that would effectively be a continuation of the Westlake corridor. Now the fun begins, as the buyout gives us a chance to take stock of the current system’s shortcomings and reimagine its future in Seattle. In the meantime, 150,000 annual riders can keep riding. The city has the money to buy out failed businesses, yet there was no money to fix pot holes, help the mentally ill, or buy more bus hours. Think about all the people that got duped into voting for Move Seattle only to find out that the council can earmark bailouts like Congress does for Wall street. Of course SDOT will argue that the businesses in the CD don’t deserve compensation. That’s because they’re too busy spending money on propping up Pronto because the director of SDOT has a personal relationship. Murray should have told the minority owned businesses the truth, you need to buy a politician if you want to get some free tax payer money. The city has been buying more bus hours. It kept the night owls running during the recession cuts, and I think it also supported the 120’s evening frequency and some other runs. Those may all have been superceded by Prop 1, but it shows the city does fund bus hours from its regular budget sometimes. And saving Pronto is a one-time capital expenditure for a greater project, supposedly. The analogy would be to keeping a pothole-filling nonprofit or a mental-health nonprofit solvent so that it could expand later, which is a greater benefit than just spending the money on potholes or mental health hours. And right now the city’s biggest chosen cause is subsidized housing and ending homelessness, so that’s where the bulk of extra money is going. Where is this pothole-filling nonprofit? That sounds like a great idea. I’ve been driving Capital Hill and the Central District. It doesn’t feel like the city fills potholes at all. Jon, what about the idea that in a very large part of the world, bicycles serve the same purpose as private automobiles. Except they take up much less room either moving or parked, leave the city quieter and the air cleaner, and leave their drivers strong, healthy, and lean? Like the bikes themselves. Rather than like reincarnated rusted out 1956 Chryslers with a ’38 Ford pickup engine block in the trunk. Like the owners themselves I kind of liked the fuzzy dice hanging from the rear-view mirrors, though. Also the corned beef sandwiches like they used to have at the counter of the [ON TOPIC] Shaker Heights LRT stop in Cleveland. So compromise. Let Seattle have the bikes, and I’ll be glad to vote to end the Health Department’s ordinances forbidding really, really fat corned beef sandwiches. Which food safety test prove kill a lot of people, except they always die with a smile on their greasy faces. The city bailed out the Pacific Place parking garage a while back for $23 million and lost money providing under-market rate parking for years. So that’s a precedent. It’s more like Car2Go without any cars being the property of the system, and instead every garage being a rental office. It might work, but I wouldn’t consider it a proven business model yet. The flip-phone vs smart phone analogy assumes that someone already has a smartphone that is proven and on the market. But the ones on the city’s website is more like it. Turns out SoBi are operating it too. I’m glad bikeshare will continue, instead of disappearing for a generation, but it would have been nice to hear a real commitment to fixing some of the most glaring problems. Why does no one on the council think the helmet law is a problem? Has anyone on the council said anything about helmets? Is the helmet law a City law? There is no state law regarding helmets. The rule in Seattle comes from the King County Board of Health – “King County Bicycle Helmet Regulations, (R&R No 03-05 (part), 7-18-2003: R&R No. 84 § 1 (part), 12-4-92)”. I wonder if Seattle can override a King County regulation? It can’t override it but it can tell the county it’s time to reconsider. 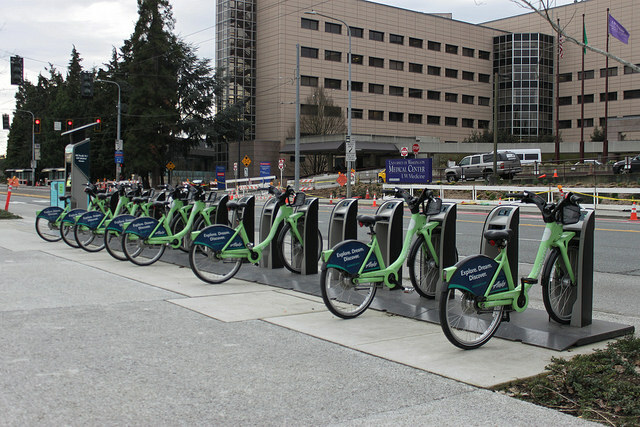 Bellevue and Kirkland are also considering bikeshares so they’ll run into the same issue. The law goes back to 1993, a time when the infrastructure was less, the population was lower, the typical bicyclists were different, climate change and resource scarcity were lesser issues, driving and housing were more affordable, and nobody had ever heard of bikesharing in downtown-ish areas. So it’s high time for the council to at least review the law and see if it’s still applicable to the current situation. It could just simply exempt bikeshare bikes from the law, if the city wants to opt them out. Insurance reasons? The first tourist that sues after an accident without wearing a helmet, could say that the city didn’t offer them that basic safety device (the helmet). Oh yeah. That case is a real winner. Sue, sue ….sue! Great news! Minor question: why is S Washington the endpoint of the 2nd Ave cycle track, and not S Jackson? Because the initial 2nd ave track was built from Occidental Park to Pike Place Market and it hasn’t been extended yet. I don ‘t know, those bikes look pretty clunky, heavy and girly. Get some decent bikes and maybe Pronto succeeds. No, they’ve all been stolen or not restocked where and when I needed one. They all have GPS tracking so they’re not likely to have been stolen. If they were gone, they were quite possibly in use. The system can’t exactly restock all day and all night if there is high usage somewhere. I have a nice slick bike and I like it a lot, but clunky, heavy bikes for rideshare has never phased me. My rideshare trips (other cities, I haven’t used Pronto yet) are generally short trips with stoplights where the added speed of my personal bike would barely matter. The focus on quality of bikes seems to miss the point of rideshare to me; it’s not about a long commute or an exercise/recreation ride. Heavy, clunky bikes phase some (me) and not others, but are certainly more of a deterrent in a hillier city and as you expand a system to allow for longer trips and (potentially) things like impromptu trips up the Burke. Certainly not suggesting the bikes are anything close to the primary problem here, but a less homogeneous fleet would certainly be more attractive. Just as ZipCar features sedans, Elements, and pickups to meet differing needs and tastes, Pronto could offer not only the current step-throughs, but also a smaller percentage of not only electrics and but also lighter city bikes or hybrids. Nearly every suggestion I’ve seen on improving Pronto seems to rely either on a large capital investment (electric bikes!) or a significant change to its economic model (longer rides!). The issue is whether either pencils out as making the thing work, and also whether the investment is worth the candle. Having the same bike everywhere has significant advantages to a system: all bikes are fungible, meaning both you don’t have to restock a mix of bikes and move them around by truck; you only have to train mechanics to work on one kind of bike; parts are fungible; and everyone using the system does so expecting the same bike. I can’t see the economics working the way you suggest. Certainly not at this price point. As I said, not suggesting the fleet is anywhere near the primary problem. The main issue, as noted in the excellent post Zach links to above, is that Seattle did a very Seattle thing and dipped its toe into something that only works if you build an actual, robust network. That said, the logistic problems you mention certainly don’t seem insurmountable. You wouldn’t have to maintain an exact percentage of each kind of bike at every station. If a typical bike shop can stock parts to repair every kind of bike that rolls through the door, certainly the Pronto shop could manage stocking parts for a whopping two models (OK, three if they added electrics). Lastly, I’ve never met a bike mechanic who somehow only knew how to work on low-end step-throughs. You could also consider charging a premium for better bikes, just like car rentals and ZipCar. You must not have seen the suggestions for more stations where people want to go and are already traveled by bike frequently; e.g., Fremont, along the Burke-Gilman, and toward Greenlake. These are not necessarily longer distances than the existing stations, they’re simply beyond the edges of the current network. With stations along the Burke-Gilman at least from Ballard to Magnuson Park, you’d get a lot of both short and long distance trips overlapping in both directions alll day, even if there’s a large “rush hour” to the UW in the morning. Shall we talk about how Kubly was managing a bike share company before coming into SDOT? I am rather amazed that he had not spearheaded a clearer direction for the program. If he can’t lead on this, what does that say about his leadership in general at SDOT? I’m not impressed thus far. But besides SDOT’s funding of more bus service, doing a better job spending the extra sales tax revenue n line with Metro’s Service Guidelines than Metro is actually doing, getting Seattle back to the front of the line to get those streetcars delivered, keeping the bike share program afloat while the city council dithered, rolling out Vision Zero, the woonerfs, the emergency bus lanes when the Aurora Bridge was shut down, and guiding Move Seattle to victory, what else brothers! (and sisters) and sisters! has Scott Kubly done for us? Most of those things you have mentioned were underway before Kubly arrived, Brent. There are some talented staff at SDOT that have been making these things happen. What is the added value of Kubly? More buses moving slower on Rainier or 23rd? Crosswalk striping disappearing all over town? Bus stop painting and bicycle lane painting that is eroding away? Parking signs plastered with graffiti and stickers that go I cleaned? New signs about turn lanes that are worse than the ones that were there before, saying a second turn lane is ‘ok’ but not saying what other directions are legal? I would much rather see this $1.4M go to better signage and paint for all modes. How many people believe Seattle will still be operating this bike rental business 5 years from now? How many people believed the government would still be operating the freeways today? If you had asked me, after Seattle had bought the million-dollar-a-piece public toilets whether or not they would still be operating those toilets in 5 years, I wouldn’t, like some d-bag, bring up freeways. I would confidently answer there is no way those toilets will still be in operation within 5 years. So Brent, do you think Seattle will still be operating Pronto 5 years from now? The only reasonable answer to your original question, asking someone to read the minds of, and tally up, what the entire human race is thinking, is best answered by Dorothy Rabinowitz. In answer to your more reasonable second question, Yes. The people who conceived and built them definitely did. Because the Army didn’t want a corporate hostile takeover to interfere with its own response to the one in progress on the West Coast in 1941. Luckily, the Japanese high command picked Pearl Harbor instead. Close one, though. Some say they could have held a beach-head, meaning a long strip far enough inland to kill Americans with rifles and bayonets ’til our forces could get there. For a battle that would have destroyed California before we won it. So I don’t think the National Defense Highway system was supposed to include the kind of long, narrow, crowded, inescapable, undefended linear field of fire a squadron of flying machine-guns (close air support) just loves. I don’t think the interstate highway system was supposed to go anyplace with traffic on it. So you’re really right Brent. Nobody foresaw an “I” in front of the “5” going by Northgate. Because in the 1940’s, when it stopped being farmland, that whole corridor would have connected with Seattle by more than one fast local, and probably private electric railroad. Councilmember Johnson’s presentation showing how Citibike is everywhere in Manhattan until Harlem, and then there are zero bikestations in Harlem, and that there are stations all over Brooklyn, but none in the Bronx, is a pretty convincing argument that the City needs to own the bike share program, regardless of whether it contracts out operation and receives advertising revenue. For a local example of how merely contracting out operation can get in the way of public access goals, consider the monorail. It is owned by the City, but the operator and Seattle Center are resisting integrating it into the public fare network (ORCA and Puget Pass), even after the contractor promised to do whatever the City asked on that issue, when it got the contract back in December of 2014. So, it is operated essentially as a private tourist trap and fundraiser for the Seattle Center, rather than a piece of the transit network. But the Seattle Center is cutting off its nose to spite its face, by discouraging regular transit riders from coming to the Seattle Center more often. The year-long ridership study is likely ignoring how much more business Seattle Center could do if the monorail were essentially free for PugetPass holders and riders transferring to other transit. If the monorail integrates into the ORCA pod, that would mean, among other things, offering a low-income fare via ORCA LIFT cards. This is similar to Pronto’s attempts to have low-income memberships, which is something to which any future bike share operator is likely to be very resistant. If they are expected to run bike-share profitably, the odds any bidder would agree to integrate into the ORCA pod at all seem pretty slim. Moreover, Sound Transit appears to be pretending the monorail does not exist when planning station placement for the South Lake Union / Ballard light rail line. If the monorail refuses fare integration, it will find itself irrelevant some day, as even the tourists take the free transfer on Link to the Seattle Center. Likewise, bike share could probably do much more brisk business if it weren’t an upcharge for the “last mile” on a transit trip. Fare integration would make a world of difference. Present handling of the Monorail is both idiotic and easy to fix. Since Sound Transit can run a streetcar line several miles long in Tacoma, a blue and white Monorail is one day’s purchase agreement away. Or an either public domain or condemnation proceeding unlikely to be contested. Since the present owner clearly isn’t either maintaining or getting any use out of it, I think a fair price would be a free ride downtown. The same as on any other elevator. Last I rode it, the city elevator inspector would have shut down any building elevator in that condition. Because that’s what the Monorail has been since the event that built it. An elevator owned by a facility that should probably be eminently domained or condemned itself. The business of bike share paying for itself through sponsorships and membership fees was never realistic. But that doesn’t mean it’s not worth doing. All forms of transportation are subsidized, and the impact of operating Pronto on the city budget is negligible. If we want bike share to succeed here, continuity of service is very important. If we were to just throw in towel and give up, after just one year, it would be very difficult to ever get bikeshare restarted again. Opponents would point to 2015 and simply say that bikeshare is an inherent failure in Seattle, and it would be up to proponents to prove otherwise. By continuing service, you allow the system a chance to grow, and with the city running it, opportunities exist to make better decisions about station placement – like locating them to generate riders, rather than to placate sponsors. Obviously, it’s not a guarantee of success, but to give up now would be a guarantee of failure. Indeed, it would have been like giving up on the HOT lanes before the pilot project was complete. Let me just say I was on a recent 37-hour vacation into Seattle & Paine Field and looked into using Pronto for day 1 of the trip. Problem is, Pronto doesn’t even go into SoDo with the living computer museum so I used Lyft to get around SoDo. It’s good us college educated, white people can get welfare. I assume you are referring to the freeways and other automobile infrastructure reserved for those rich enough to own cars. If bikes are one more thing to lure tourists, it’s an economic benefit to the city. If residents are traveling by bike, that’s fewer car lanes and parking spaces needad around town, which saves a lot more money than the bikeshare costs, and gives the city more room for housing and businesses. Sidewalks are subsidized5, roads are subsidized, highways…everything. Why not bikes? More bikes is better. More cars is bad. Questions? Time to start taxing bike riders or charging a yearly fee to pay for their lanes and bailouts because they are not paying their fair share right now. I don’t know how Seattle’s numbers stack up, but it looks to me as though a lot of the city transportation budget comes from sales taxes and property taxes. The car tab for transit doesn’t go for bikes. So, I don’t see where motorist are taxed for city streets more than bicyclists are.